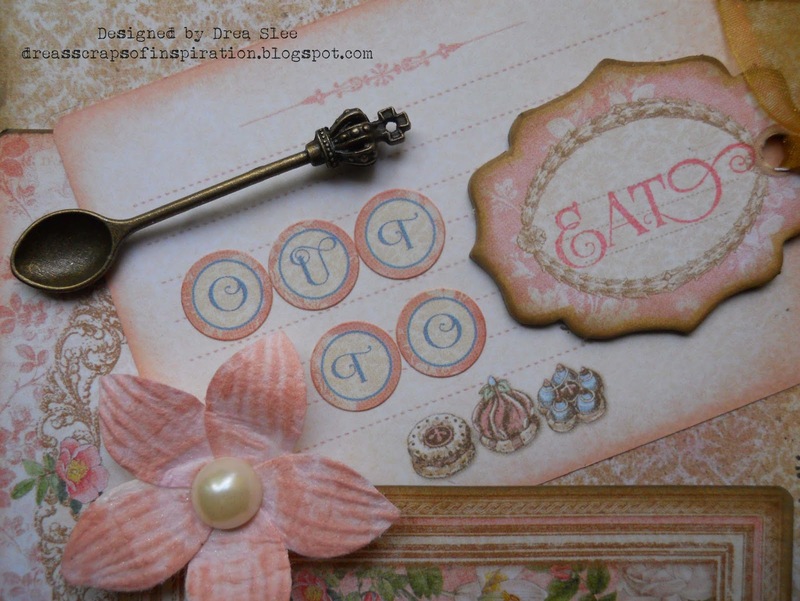 Drea here with another layout to share using the beautiful Graphic 45 Gilded Lily I Want It All Bundle! 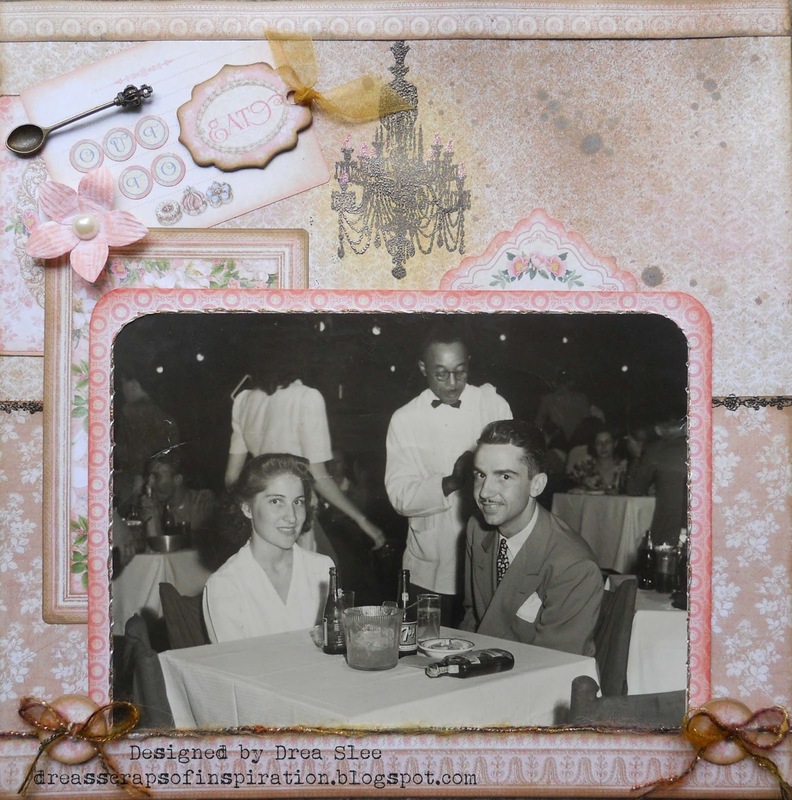 I wanted to keep it simple and elegant with this old photo of my husbands late grandparents. 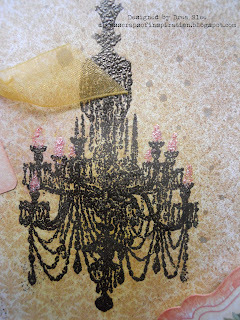 Using my papers, I created a wall with "wallpapers" and "moldings" adding the antique bronze embossing with the Gilded Lily 1 Cling Stamp as a chair rail. 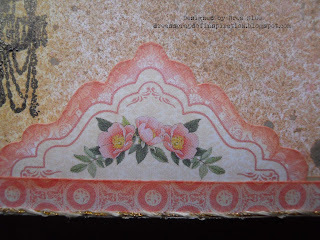 The lower "wallpaper" came from the 6 X 6 Patterns and Solids. Along the upper part of the page, I used some mists, and Distress Ink (Scattered Straw) to light the chandelier that I embossed with the Gilded Lily 2 Cling Stamp. I also added little light bulbs to it with some Stickles (Cotton Candy Pink). I did some hand-stitching with cream and gold thread around the photo, backing it with kraft cardstock, to make a pocket for extra photos, since this is for an album I've been working on for my sister-in-law. I made a flap for it with a piece from the Tags and Pockets. 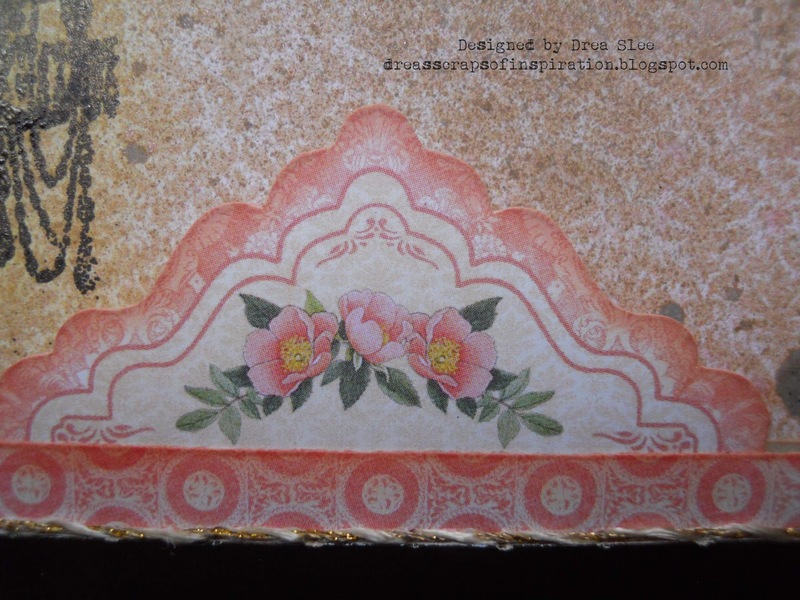 The titlework started by layering the Ephemera Cards , inked around the edges with Distress Inks, (Tattered Rose) and (Frayed Burlap), which I also used throughout this page. I spelled "OUT TO" with the Sticker Sheet, and stamped EAT onto a piece of Journaling Chipboard, using the Gilded Lily 2 Cling Stamp again. Then I added the sheer ribbon and flower from my own stash. The final touch and my FAVORITE piece, is the spoon that comes in the Vintage Charms, which have been hand selected exclusively by FotoBella! Be sure to pick up your own bundle, and for those who really want it all, you can get the Gilded Lily I REALLY Want It All Bundle! Thanks for your visit! Beautiful detail in this layout Drea.